please telephone: +1-707-677-0840 noon-6pm, and book online from our mobile page. Another Year Rated at #1 - Thanks Trip Advisor Guest Reviewers! Welcome Guests! 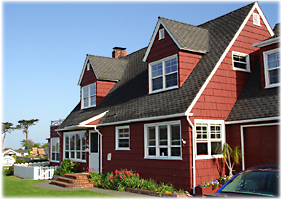 In the heart of town, on a bluff overlooking Trinidad Bay and the Trinidad Memorial, is the Trinidad Bay Bed & Breakfast Hotel. The only historic B&B in Trinidad, this Cape Cod style home was lovingly converted about 35 years ago. It is a quintessential B&B, and one of Trinidad's Icons. Redesigned with an upscale decor and amenities, each of our 4 guest rooms has a super plush king size bed with luxurious linens, a private bath, and spectacular bay, ocean, garden, and Trinidad Head views. Enjoy a served 3 course breakfast, free WiFi, complimentary toiletries, hairdryers and schedule free airport pick-ups. We never require multi-night minimums & we offer seasonal specials. An unique lodging option. Great value, even when considering budget travel hotels, motels, inns, and other standard accommodations near Eureka, Ca or Redwood National and State Parks. You'll want to stay another day". Guest rooms are named and designed to reflect our local North Coast attractions - Tide Pool, Redwoods, Trinity Alps, and the cute little Crab Pot. My mother says this adds to the charm of our delightful seaside Inn. We do our best to give you a great value, sharing scenic Trinidad and the Inn with as many people as we can accommodate each year. Average room rates range from $200 to $300 per night and we never take advantage of our guests by requiring a multi-night minimum on weekends, or by "jacking-up" our rates for holidays or HSU graduation. We are here for your convenience and comfort, not ours. Start your day with a hearty breakfast and some fun conversation. Specialties of the house include a variety of baked fruits and hot entrees, fresh baked breads, muffins and cinnamon rolls, fruit and beverages. We love meeting guests from around the world, and chatting over breakfast. We also realize not everyone wants the traditional, social B&B experience. Two rooms have private entrances, so you may personalize your level of interaction with the rest of the house. Children are welcome too! The recently refreshed Trinity Alps room over the garage has a kitchenette and is separate enough from the house that you won't have to worry about the littlest ones disturbing other guests. Besides the lighthouse, tide pools and redwood walks, kids will enjoy the Trinidad Pier and the HSU Marine Lab with it's sea critter touch tanks. Owner Mike Morgan (Captain Morgan) would be happy to show off the Trinidad Volunteer Fire House. Trinidad is an alluring travel destination. Its scenic beauty is legendary. Anchored on a high bluff, overlooking the rugged California Coast with picturesque fishing and crabbing boats in its sparkling harbor below. The off-shore rocks and sea stacks are part of the California Coastal National Monument. Trinidad is a Gateway City honored for viewing this spectacular national treasure. Local shops and restaurants are a short walk away. A trail around Trinidad Head offers superb spots for picnicking and whale watching. Visit six nearby beaches, trails, Redwood National Park and many other fine state and local parks like Patrick's Point, Prairie Creek. Don't miss Fern Canyon and the victorian village of Fernadale. Start your Lighthouse Passport collection with two Trinidad lighthouse stamps. Nature at it's wildest! Late Spring and Summer are filled with hearty outdoor activities. Fall and Winter are appealing times for those who savor cozy, rainy nights and contemplative, fog-laden days. Offering travelers serene vacations with relaxing, comforting accommodations, special courtesies, and unmatched service, all in the magical setting of Trinidad. Guest rooms are priced around $195-$475 per night. They each have a private bathroom, a king size bed with 1,000 count Egyptian cotton sheets, and they all enjoy spectacular views of Trinidad Bay. A hearty breakfast is served in the main house, or for the Trinity and Tide Pool rooms, you may eat in at your request. The Redwoods and Crab Pot rooms are located across the hall from each other, and are great to rent jointly for families or couples traveling together. Free Wi-Fi throughout, and of course we are happy to help with your dinner reservations. Reservations require a 2 night minimum?!! Not with us - ever! We also don't jack up rates on holidays or busy weekends. At booking, a NON-REFUNDABLE $150 PER DAY RESERVED reservation fee is charged. Reservations may be made with a valid VISA, MasterCard or American Express and Direct Invoicing can be arranged by phone. Please telephone: (707) 677-0840 or you may check availability and buy from our online mobile site. Cancellations require a 7 day prior to arrival notice, or you are responsible for the full cost of your reserved room for your reserved time - no matter the situation. If you miss your deadline, we will try to re-rent your reserved room for you and at Owner's discretion, you may receive a partial refund. Please telephone: (707) 677-0840 if your plans change. Check-in around 3p. We request after 3p. arrival arrangements be made in advance. Without such arrangements, rooms may not be held after 6p and no refund will be issued. Check-out around 1p. Relax, you don't have to be out by 11:00a like some hotels. Rates are based on double occupancy and include a three course breakfast served about 8:30. City bed tax of 12% and County tax of 2% will be added. All rates and restrictions are subject to change without notice here. Please txt or phone (707) 677-0840 before booking, if you are unsure of our policies referenced here. Restrictions: Due to guest allergies, crated pets may overnight in the garage, and smoking only outside please. Nearest Airport: Arcata-Eureka Airport in McKinleyville, 10 minutes from Trinidad via CA Highway 101. Rental cars available at the airport, or schedule us to pick you up for free! Driving to Trinidad: Portland 8hr, San Francisco 6hr, Sacramento 6hr, Grants Pass 3hr, Redding 3hr, Mendocino 4hr. 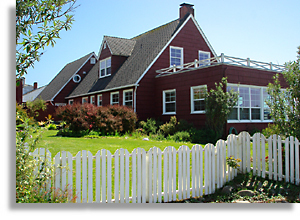 Trinidad Bay BnB Innkeeper's Blog - posts from a host's perspective. A Job Worth Doing ... Councilmember Mike's Trinidad City Council Blog from his years in office. Jim Popenoe's Trinidad site has a wealth of Trinidad information and images. "Discover Trinidad ... Again and Again" - A sublime story chosen in the Greater Trinidad Chamber of Commerce "reDiscover Trinidad" Story Contest. A local Humboldt, Ca writer gives an unique perspective upon discovering Trinidad. There are several other beautiful, heart-felt stories to read there, so check out the "reDiscover Trinidad" contest pages archived by Trinidad California Tourism. 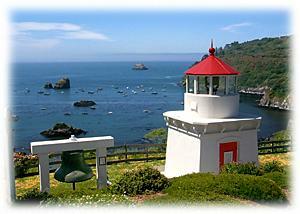 Greater Trinidad Chamber of Commerce - Discover Trinidad California. Trinidad's Chamber of Commerce is special in that it relies more on individual members for support than most Chambers. Just about everyone volunteers or plays a part in the annual Trinidad Fish Festival FUNdraiser. Beautifully located bed and breakfast hotel in the heart of town by Trinidad Bay - right across the street from the Memorial Lighthouse. Watch the sun rise while enjoying your delightful three-course served breakfast - included free!